The remote shows up in Windows as an HID device, so I figured there was some way to communicate with it. I searched the internet and came up with a solution. Using a great little program called AutoHotKey and working off examples and scripts from other users. I created a script that will interface with the Griffin Airclick USB to simulate windows media keys, and allow the Airclick to function in any operating system that AutoHotKey can run in. The script has a simple HUD to give you response when a key press is successful, and in addition to controlling volume, play/pause, previous/next, the script will also put your computer to sleep if you hold down the volume down key for a few seconds. If this function is used, before sleep the system volume is set at 20%, so that, if you have an alarm that wakes your computer from sleep (like me) the music will be audible. Just set the compiled script to start-up when Windows starts by putting it (or a shortcut) in the startup folder of the start menu. The remote works in winamp, VLC, PowerDVD, media player classic, WMP, and any media player using windows media keys. To those of you with itunes, you may want to use ITunesControl to send media keys commands to Itunes when it is not focused. 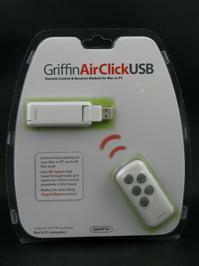 This will allow you to control Itunes with the griffin airclick even when it is not focused. You can also use AutoHotKey to replace programs like Intellipoint for Microsoft Mice, or SetPoint for Logitech Mice. I figured I was going to have this script loaded in the background anyway, so I added some extra functionality to my mouse precluding the need for any extra software from the hardware manufacturer, and AutoHotKey is much more configurable than either of the programs mentioned above. This is so awesome! It works for me in winamp, powerDVD, VLC, wow! awesome, your my hero. l loved my airclick, but didnt get it work under win7 64bit, many thanks! but how can i make it work with winamp? Sweet simple working one buddy !! thanks !! Hello! And thanks so much for this AHK script. I was just about to sell my AirClick when I stumbled across your script. It works a treat, with one unfortunate exception: The AirClick controls only work if iTunes is focused in the foreground. How can I alter the script to control iTunes in the background as well as the foreground. I am running Windows 7 Professional (64-bit); AirClick USB driver 2.0; iTunes 9.0.2.25 (64-bit); and AutoHotKey version 1.0.48.05. Many thanks again, and in advance if you can help me in modifying this already terrific solution. Three cheers! Is there a way to make this work for Powerpoint? Or can you steer me in the direction for finding out? Thanks so much for making this available! Awesome work, thanks so much for making this! Adding Powerpoint support shouldn't be hard. I also realized that Winamp support doesn't work without turning on media keys in winamp. I've fixed a few issues with the script. I will add Powerpoint support and then upload it in the next few weeks. There actually is a solution for this great little piece of hardware. Too bad it doesn't work whena a program like itunes is running in the back. Good solution anyway! A big thank you! I think I did a search about the Itunes stuff when someone else had a problem with it. It works off media keys, so if you can get iTunes to accept media keys while not focused, the remote will work too. Not a computer program type person, is there any step by step instructions to make this work on my Win 7 64 machine? Just download the compiled script and run it. It should make an icon in your taskbar tray area. That's all. If you want it to start-up with windows, just put it in your startup folder. I needed a remote control for my PC, and a friend had found a cheap little RF remote that seems to get the job done: the Griffin Airclick. The remote has been discontinued but you can still find it very cheap. I got mine off ebay for \$8 shipped. I use Windows 7 64bit, and it just so happens that the software for the remote does not work in Vista 64 or Windows 7 64. Knowing the remote had been discontinued, I needed to make my own interface for the device.